A very common, not at all serious, but a really uncomfortable condition that most of us encounter is a sore throat. It is an infection of the throat and is also known as pharyngitis. Symptoms of a sore throat usually include pain and difficulty in swallowing, fever, weakness, dryness of throat, mild cough, hoarseness, and headache. It is commonly caused due to bacterial or viral infections, cold, and allergy. Small children, smokers, immunocompromised and allergic individuals are more likely to suffer from it frequently. Usually, a sore throat goes after a few days on its own. The symptoms get worse for the first 3 to 4 days and then gradually subsides in a week. But during the course of illness, the pain and discomfort are really distressing and you must be looking for some effective solutions to get rid of a sore throat. Below are effective and safe home remedies to ease your symptoms. 1. Salt water gargle– This is an effective and a traditional way to get rid of a sore throat. It reduces inflammation, swelling and thins the mucus. For this take a glass of warm water, add a teaspoon salt to it and gargle for 5 minutes. Repeat this several times a day. This will draw water from the swollen cells and will shrink them along with killing the germs and soothing the throat. You may also add baking soda, which is antibacterial and alkaline in nature and not only kills the germs but also soothes irritation. * Avoid adding salt and baking soda to warm water if you have high blood pressure. *Remeber not to swallow salt water or it may cause dehydration. 2. Lemon and honey– Lemon contains Vitamin C that boosts immunity and honey acts as antibacterial and antiviral. Take a cup of hot water. Add 2 teaspoon honey and a teaspoon lemon juice to it. Sip this concoction slowly. Drink it 3 times a day to relieve pain. 3. Licorice root, chamomile flower, cinnamon and clove tea- Licorice root, chamomile and cloves have anti-inflammatory, antiviral and anti-bacterial properties. They reduce swelling and irritation. Cinnamon, on the other hand, helps to keep the body warm. Grind all the ingredients and put them in a cup of boiling water. Steep for 15 minutes and then strain the concoction. Drink it to relieve pain and get rid of a sore throat. 4. 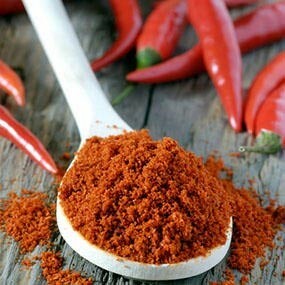 Cayenne pepper- It acts as a pain reliever due to Capsaicin present in it. Take 1 cup of hot water and add one-fourth teaspoon cayenne pepper and 1 teaspoon honey to it. Mix ingredients and drink it slowly. 5. Ginger and holy basil leave tea– Ginger flushes out the toxins from the body. It boosts blood circulation, kills germs and treats flem in throat. Holy basil leaves are antibacterial and antioxidants. Grind few slices of ginger and 3 to 4 holy basil leaves. Add them to the steaming water. Steep for 15 minutes and then strain it. You may also add honey in it. Now sip the concoction slowly to soothe and get rid of a sore throat. Besides above home remedies to get rid of a sore throat make sure to eat foods rich in Vitamin C as it boosts your immune system and drinks lots of fluids.